Home People ‘Aavaran’ From Udaipur Has Taken Mewar’s Dabu Hand Prints to International Levels! Truly living up to its name ‘Aavaran- Echoes of Rural India’, has taken Mewar’s Dabu work to international levels. Aavaran derives its inspiration and beauty from the indigenous work of the families residing near Udaipur. The dabu work is an exemplary example of the art of indigenous communities of Rajasthan, known to be one of the best art forms in the entire nation. I visited Aavaran a few days back and as soon as I entered the main area I was startled by the fact that everything around me had the aboriginal Indigo color. The spreads, the cushion covers, the coasters, even the ‘chappals’ were made from the Indigo dyed cloths. Aavaran believes in zero waste hence even the ornamentations were made from the scrapes of the Indigo clothes. I noticed motifs getting printed over cotton cloths via hand block printing- the blocks for printing are being hand carved. It is a long process but the output is simply stunning and pleasing to the eyes. I got into a conversation with the managing team there and came to know some staggering facts, figures, and information about Aavaran which surely made me awestruck, amazed and proud. 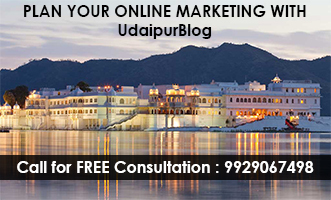 Yes, proud that Udaipur has some hidden gems which we people are still missing on. What exactly is Dabu Work? Dabu is mud resist hand block printing technique from ancient Rajasthan. The practice almost died out in the last century but was revived and flourished by organizations like Aavaran. This technique of cloth printing is quite laborious and involves several stages of printing and dyeing. At Aavaran, artisans also make use of double and triple dabu techniques for cloth printing. Undoubtedly, the result is extraordinarily beautiful. 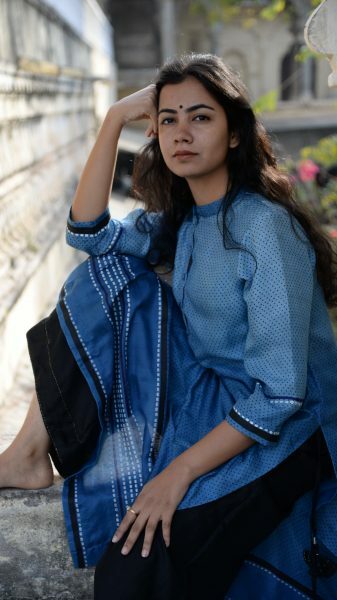 Based out of Udaipur, Aavaran was started by Ms Alka Sharma, who is a textile grad from Indian Institute of Crafts and Design, Jaipur. She, from her childhood, always had a thought for bringing out the craftsmanship of Indian rural communities. 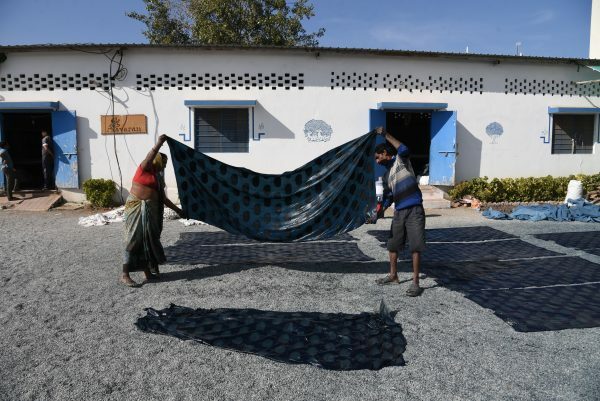 One such community lives in Akola, a village near Udaipur, which utilizes a cloth dyeing technique called Dabu. Ms Alka, fascinated by the artwork, urged to sustain this impeccable yet dying art form. She calls Aavaran a journey started to uphold the rural indigenous communities and their traditional craft. 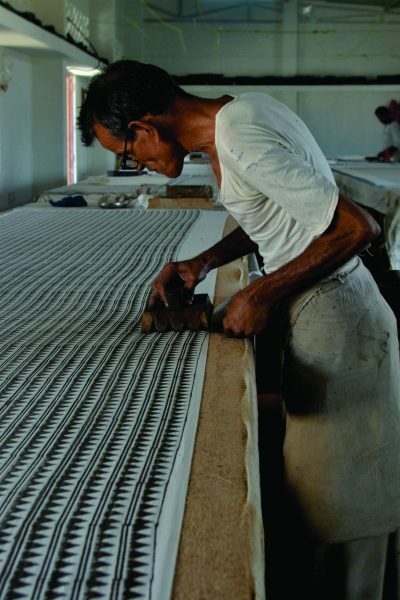 Aavaran’s attempt is to evolve and sustain the traditional ‘Dabu’ mud resist technique of hand printing, specifically the indigo dyed ‘phentiya’ print which is a staple of Mewar Region. Aavaran has almost 280 people working with them, out of which 80 are skilled artisans. 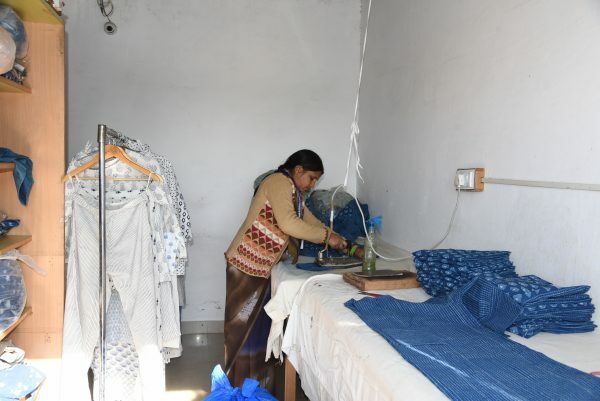 There are 200 ladies who with the support of Hindustan Zinc Limited and Aavaran by COS-V, have learned different skills like stitching, hand embroidery, rug making, accessory making etc. and work for Aavaran, which helps them to generate a livelihood for themselves. Rest of the 80 artisans work at the Aavaran production unit, where they are involved in the activities of Dyeing, Printing, Stitching and so on. 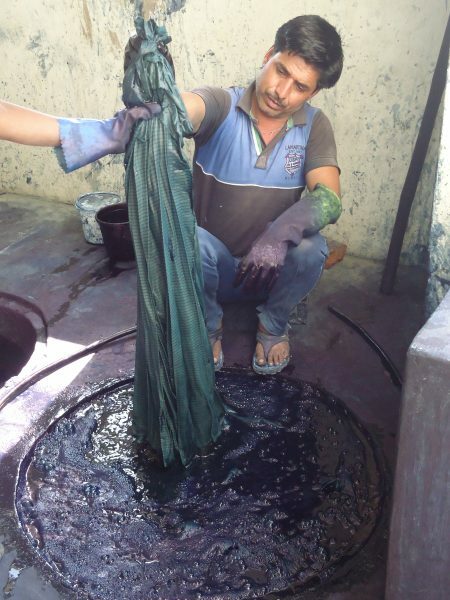 Aavaran uses Dabu Mud resists hand block printing as the primary technique wherein natural dyes are utilized like Haldi Dye, Manjistha Dye, Kashish & Indigo Dye. Apart from this, Aavaran has developed Ayurvastra which is a 5000-year-old philosophy revolving around Ayurveda. Here organic cotton is treated with a defined combination of herbs and oil which treats ailments and heals inside out. Clothes dyed under the concept of Ayurvastra help in increasing the immunity and reaching a better mental equilibrium. Aavaran, not only produces goods under their label but also for other renowned labels. This has subsequently increased Aavaran’s presence in India as well as in the entire world. One of the prime people working with Aavaran is Mr. Ramkishore Ji Chippa, who has received an award from CRAFT COUNCIL OF INDIA, for the natural dyeing process in the year 2016, which is indeed a big accomplishment for Aavaran. The workspace of Aavaran is a beautiful premise with loads of dedicated workers and artisans joining hands together to create impeccable and outstanding pieces of apparels. With 3 different outlets in Udaipur, Jaipur, and Bengaluru, Aavaran has established its name in the textile industry via reviving a unique art of hand dyed prints. The journey of Aavaran has been through ups and downs. 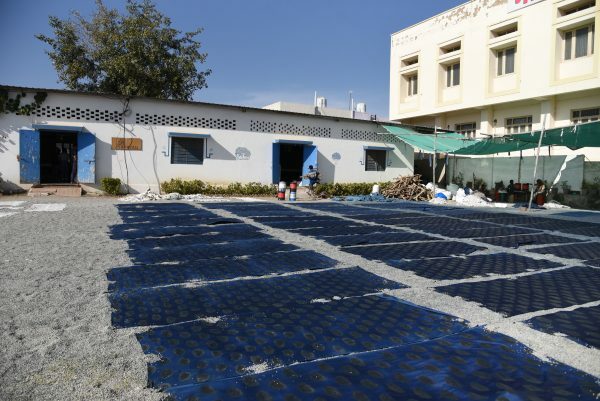 With climate changes and other factors, it has seen quite a number of hurdles in its journey and despite all these issues it has risen and planned a better life for artisans.